The QBCC advised that the Spiral Spring Mixer Tap tapware purchased from Aldi in June showed potential of lead contamination. “Our initial test results show that there is a cause for concern, and that the tapware may cause lead contamination of drinking water,” QBCC Commissioner Brett Bassett said. “Tests by Queensland Health Forensic and Scientific Services have shown that lead levels are up to 15 times the maximum acceptable level of lead in drinking water, as per Australian Drinking Water Guidelines. 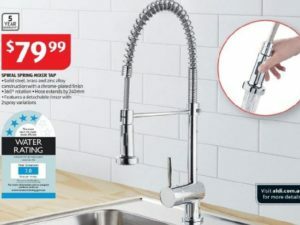 “The tapware in question is the ‘Spiral Spring Mixer Tap’ (EASY HOME brand, model number NI183ESCRT-AUD), and it’s believed that more than 3,000 units have been sold in Queensland. “The QBCC’s Product Committee is aware of the issue, and further testing has been planned, to understand the full extent of the potential issue. “The QBCC has also advised the Australian Competition and Consumer Commission (ACCC) of the test results. For further information please visit the QBCC Website. ALDI Australia is pleased to confirm that the Spiral Spring Mixer Tap, sold as a Special Buy on 10 June 2017 has passed additional testing against AS/NZS 4020:2005, which is required for the Australian WaterMark certification and is the testing method under the Australian Drinking Water Guidelines. The additional test was conducted by a laboratory accredited by the National Association of Testing Authorities (NATA) for this Standard, meaning that the product is safe for use. This result is consistent with previous independent testing, which was conducted prior to sale. “At ALDI, we are committed to providing our customers with safe products of the highest quality. For this reason, I was alarmed by the claims suggesting that the Spiral Spring Mixer Tap, sold as a Special Buy on 10th June this year, may contaminate drinking water. I can assure you that as soon as this matter was brought to ALDI’s attention, we initiated a priority investigation. Our teams have worked tirelessly with authorities and independent testing laboratories to confirm that the tests conducted prior to sale were accurate, and the product is safe,” said Tom Daunt, CEO of ALDI Australia. “We are disappointed that so many ALDI customers were provided information that generated such unnecessary concern and inconvenience. The Queensland Building and Construction Commission’s prematurely published statements were based on tests that were not conducted in accordance with the Australian Standard.” Mr. Daunt said. For more information please see the Aldi media release.